It could join the ranks of being one of the world’s few hybrid convertibles. Earlier this week Porsche surprised us by letting one of its new 911 prototypes roam around in the snow without wearing any camouflage, much to the pleasure of our pesky prying spy photographers. 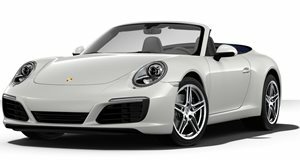 Only thing is that there are three body styles of the 911, a coupe, cabrio, and targa, and the previous images only showed off the hard-top version of the sports car. Not so anymore as Porsche has just sent the second of those three models, the cabriolet, out into the wild for the same round of testing. Like the coupe (and pretty much every other Porsche 911 ever), the new 911 looks almost identical to its predecessor. If it ain’t broke don't fix it right? Just like every Porsche before it, the changes made to this 911 are incremental, following Stuttgart’s tradition of a crawling slow-paced evolution. Different here is the hood, which creeps ever so close to the front bumper, kissing it without an impeding dividing section of front body panel. From what we can see, Porsche engineers really wanted to wring every ounce of track ability out of the chassis to make this 911 inexplicably better than the previous one. No manipulation of physics is made to accomplish this goal, though, just old fashioned tactics. These include widening the car for more control in the corners and adding a massive active rear wing that runs the length of the rear end. New door handles complete the transition to the next 911 body while a larger rear apron houses four exhaust pipes, signifying that this cabriolet has the optional sport exhaust package. As with the coupe, the cabriolet could be one of the first 911s to get Porsche’s hybrid system which, as ironic as it seems, would continue the trend of having supercars like the Ferrari LaFerrari Aperta and Porsche 918 Spyder being some of the world’s only hybrid convertibles. The new 911 Cabriolet will hit the Frankfurt Motor Show in 2019 leaving, thanks to this naked mule, only its specifications as a mystery.